An Honest Review of The Motorola MB7420 Cable Modem – How Does It Stack Up? Continue to read our Motorola MB7420 review to find out which option is the best. Are you planning to use cable internet services? It’s obviously inevitable that you will need a cable modem when you sign up for the services. Now, two options are available, one, buying your own cable modem or, two, relying on the modem from the service provider (ISP). Personally, I thought the second option was budget friendly until I learned of the big chunk I would save by buying my own. I mean, what would be the rationale for paying up to $10 monthly rental fee instead of buying your own modem e.g. the MB7420 cable modem? In our Motorola MB7420 review we will present you all of this devices ups and downs. It is well documented that a good number of cable internet users are still reliant on ISP-provided equipment. This is a clear indication that most people are not yet aware of the savings they would make by buying their own modem. The current scenario of the cable internet services allows you to buy your own modem. This is made easier by a functioning standard called the “data over cable service interface specification” or simply the DOCSIS. Since the DOCSIS is standardized you can bring your own hardware and you are not limited to the cable modem offered by the ISP. However, it’s not a wise idea to buy a modem if your ISP (like Charter) doesn’t allow customer-owned modem on their network. Another scenario that will limit you to an ISP-provided device is when the package you are using requires a unique gateway that might not be purchased from retail stores. If you are looking for a cable modem that meets the DOCSIS 3.0 standard and provides high-speed internet, this might be your perfect device. Motorola cable modem has a 10/100/1000 Gigabit Ethernet LAN port that allows you to easily connect your TV, computer, wireless router, play station, and other major Ethernet-capable devices to the cable network. To minimize its shelf space, the device is made in a compact design which is very attractive and matches any interior décor. Its design also helps improve cooling and extend the life of the device, this, combined with its power surge and lightning protector guarantees nothing but quality and reliability. This modem is 16 times faster than the DOCSIS 2.0, thanks to its super-fast download and upload speed. Its speed allows you to enjoy a reliable internet and the versatility of a kind due to its compatibility with the DOCSIS 2.0 and 1.1 internet services. The MB7420 cable modem has 4 upstream channels and 16 downstream channels. This boosts its download speed to 686Mbps (maximum) and an upload speed of up to 123Mbps. This bandwidth is ‘enough’ going by the current industry standards. This modem excels in its quality of service because of its digital full-band tuner. 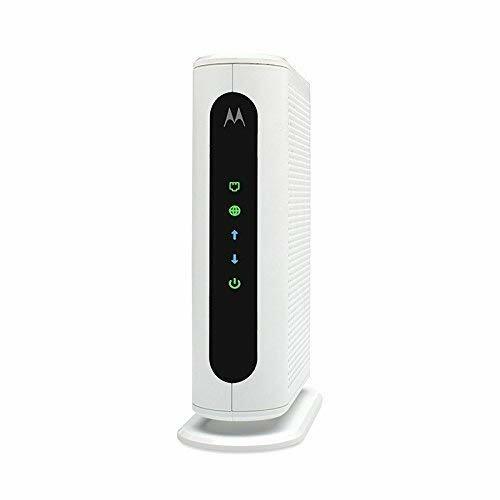 Many cable modems will cut out whenever the online traffic is congested, but that is not the case with Motorola MB7420 cable modem. Although the modem doesn’t manage all the 16 channels simultaneously, it can automatically select the ones with the lowest traffic. This feature also helps your ISP to accelerate downloads and at times provide more channels. The quick start guide describes the setup process in a vivid manner, making it extremely easy and fast for everyone. If there is anything you need to confirm, the experienced customer care will be there for your rescue. The modem is also color-coded to make it easy for anyone to set it up. The Motorola MB7420 modem is a 16 × 4 cable modem that is compatible with many ISPs including time warner, Comcast, cable LABs and other major ISPs. The modem has all the features of a modern modem and includes Motorola extras like lightning protection, advanced surge protection, and a user-friendly setup. It is also made of a sleek and alluring design that is meant to match any interior décor whether in the office or at home. When you purchase the modem, the following will be included in the package. The Motorola MB7420 has DHCP client, IPv4 support, IPv6 support, TFTP client, auto-uplink (auto MDI/MDI-X). It has AC 110 V as far as power requirements are concerned and for the sake of curiosity, it runs at minimum a minimum of 32 °F and a maximum 104 °F temperatures. The cable modem market is flooded with many brands giving promises to deliver fast and reliable internet. With its broad capability, high speed, and easy installation the Motorola MB7420 cable modem is the perfect equipment for any cable internet user. If you have multiple devices you can easily plug this router to either wireless or wired router for ease of sharing. Play no more waiting game to get this device and stop relying on modems offered by your ISP. We hope you liked our Motorola MB7420 Review, if you have any suggestions feel free to send us a message, we are always looking for new ideas.